Uses next GenGallery for maintainig the greeting card picture. 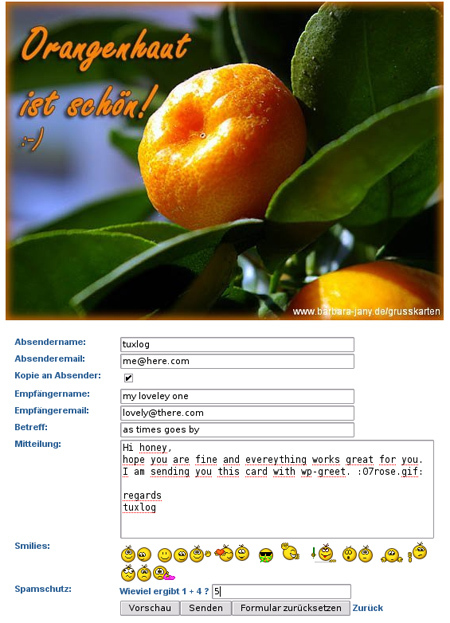 Provide your site with online Greeting Card to improve your site visitor. This Plugin are required WordPress 2.5 or higher and work good on v3.2.1 or later. Download WP – Greet. The above instructions are quite minimal. Also, no help inside dashboard once the plugin is installed. Not clear, do I also have to install the NextGen Gallery plugin, or is it already built into this plugin? Question: WordPress lets us create galleries, why not have used these default galleries, instead of complicating matters by adding another plugin to handle? Nice that it allows a postage stamp, but I have no clue how to get this to work, so.. Suggestion: could you do a little video on how to implement this, please, and post it at YouTube. It will just get you more views and customers if you did so.